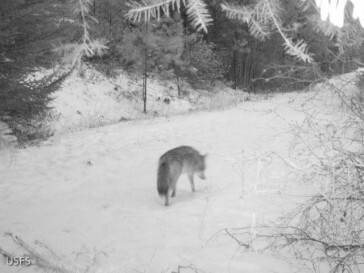 This winter I have been running remote cameras of mine, and assisting the Ray Robertson and the United States Forest Service with the deployment of several others in various locations around the Methow Valley here in north central Washington. Remote cameras are considered a non-invasive research method, as they provide a means to monitor wildlife without having to handle or even directly observe them. Remote cameras greatly increases the amount of time we can monitor a location and also reduces our impact on the species we are studying by limiting the amount of time we are actually in the field in their habitat. Remote cameras, if set thoughtfully can also provide beautiful images that both document various species of wildlife while also illustrating their relationship to their environment and each other. Here is some of what we have been finding this winter here on the eastern slope of the North Cascades. Mule deer, such as these two are one of the most conspicuous species of wildlife in the Methow Valley and show up in camera sets in many low elevation camera traps around the valley. A young mountain lion explores the same location where the deer from the previous image had visited earlier. Other images from this camera captured both this lion and its mother in the same location. An adult mountain lion sniffs at the buried remains of a deer which had been cached about a week before by either himself or possibly another lion that uses this area. After inspecting the area briefly, this lion moved on without retrieving anything of the buried carcass. Golden eagle and black-billed magpie feeding on the remains of this same carcass which had been excavated by a bobcat several days earlier. In this image I had the camera looking down on the sight from an overhanging tree branch. A group of river otters bounds along the banks of the Methow River. I set this camera at a location where I had found sign of a number of species of wildlife and the set also captured images of mountain lion, deer and beaver. A photo of myself. 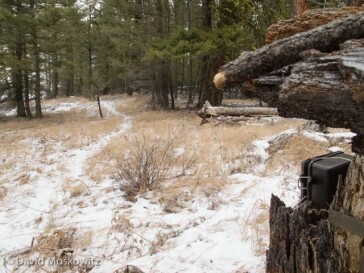 As part of setting a camera trap I will trigger the camera and then inspect the images it is capturing to make sure the focal area of the camera is capturing the area I am interested in. Behind me is the remains of a mule deer that had been killed and consumed by wolves several weeks earlier. Here I am using the carcass as an attractant to draw carnivores into the range of the camera. A pair of coyotes inspecting the carcass. They scent marked the area and then left without scavenging on the carcass. This bobcat was more interested in getting a meal out of the deer carcass! Even after many other visitors, a hungry wolf returned to the carcass to feed on the bones and hide that remained. A mule deer buck captured on a Forest Service camera set by Ray Robertson and I in a location we had found tracks of wolves. A daytime image from the same camera. The short ears and stocky muzzle of this animal identify it as a wolf. Several weeks later, this coyote was captured at the same location, identified by its more slender build and narrow snout. 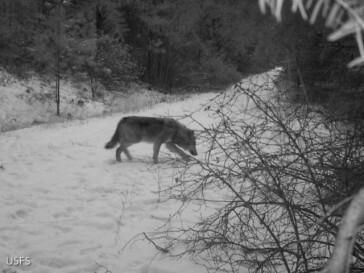 Remote camera set targeting wolves and mountain lions along a game trail. For this camera set I am anticipating the travel route of these species through my interpretation of their tracks and knowledge of how they typically travel through this particular location. I expect that I will also get photos of mule deer, and coyotes as well as possibly bobcats and red squirrels. Will keep you posted on how this one turns out…its out there right now! Productive remote camera traps aren't just created by sticking a camera up just anywhere in the woods. It requires careful observation of tracks and signs, knowledge of the target species biology and ecology, how to use natural and imported attractants, as well as specific tricks on how to get the most out of the equipment you are using in the field. Click here to learn more about remote cameras and other non-invasive wildlife research methods. David Moskowitz provides custom trainings on many of these methods and consulting services for projects looking to employ them effectively and efficiently in the field.